It's 1976 (don't argue!). You want to buy a motorcycle. A Very Fast motorcycle. It must come with a warranty and be reliable, so thinly-disguised racetrack refugees are out. What to buy? Honda is still churning out basically the same CB750 as they did in 1969. The GoldWing isn't really terribly fast and handles like a hippopotamus in a supermarket trolley. Suzuki's best effort is the GT750 Kettle. Until the new XS750 triple reaches the shops Yamaha can only offer a 650cc vertical twin - and if you wanted one of those you'd get a Triumph or a Norton, even if you suspect that the whole British industry is about to go belly-up. The Moto Guzzi Le Mans 850 looks great and can clock over 130mph, but it's just another twin. And it has shaft drive, which everyone knows makes the gearbox awful and ruins the handling. Same goes for the BMW R90S, which you might consider buying when you're old and grey, perhaps. A motorcycle with a clock? Whatever next? 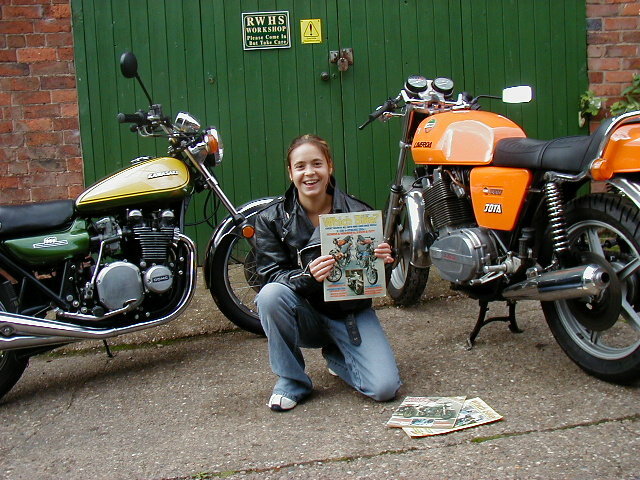 No; perusing the bike mags reveals that if speed is your need it really has to be a Kawasaki 900 or a Laverda 1000. The Kaw' has been around since 1973, running through Z1, Z1A and Z1B variants before turning into the Z900 for '76. When launched, the big 903cc four engine was the absolute King, its 82bhp being enough for a 12.3 second standing quarter mile and a top speed of 132mph. At the other extreme, it could dawdle along at just over tickover in top and still accelerate strongly, just by twisting the throttle. As usual for a Japanese bike, only the handling was slightly suspect. The frame seemed basically OK, but the forks looked weak, and those instant-slip nylon tyres were best replaced by a set of decent Dunlops or Avons as soon as possible. Mind you, with so much power on tap, after a couple of thousand miles the rear boot will be vaporised, anyway. That's another twenty-five quid down the drain, on top of £1369 for the bike - which is enough to buy a nice car, as boring people keep pointing out. Still, unlike a Cortina, at least a Z1 does 45mpg, which is a real bonus now that a gallon of 2-star is an extortionate 70p. That's fourteen bob in real money, remember! "unlike a Cortina, at least a Z1 does 45mpg"
The bad news is that the Z900's engine has been detuned. Whatever the spec sheet says, smaller 26mm carbs and stifled exhausts have cut the power. The top whack is now more like 125mph and a standing quarter can take 13 seconds, if some roadtests are to be believed. Also, after three years on the market, the big Kaw' has far less pizzazz than it did, which is worth thinking about if you're a poser. At least the handling is better now, mostly due to a new set of forks with longer sliders. Not sure if that helps the looks much, though, and the styling already looks a bit dated. Some people even reckon the Z900's graphics and four chromed silencers are passe now that 4-into-1s are becoming fashionable. So maybe the new Laverda Jota is the thing to go for? Sounds absolutely amazing, and it's been clocked officially at over 140 - the fastest ever for a stock bike. Other pluses include Brembo brakes that work in the rain, Italian frame expertise and quality suspension. Oh, and apparently most of the electrics are German stuff, so it should keep going if you sneeze on it, unlike a Ducati 900SS. Let's hope so, because Laverda dealers are thinly spread. The immediate problem, though, is that it costs over two thousand quid! Could a Jota really be worth nearly 50% more than a Z900? Now it's 2003 (time flies). You are slightly older, but you haven't quite grown up yet, so you still want to buy a very fast motorcycle. Thirty years after the Z1 amazed everyone by doing over 130mph in black & white roadtests, there are plenty of bikes capable of nearly 200mph, straight from the crate. Which is all very well, but although your reckless streak never quite went away, you are mature enough to appreciate that exceeding the national speed limit by 200% isn't very sensible. Besides, you've already been Gatso-ed several times and a ban is on the horizon. But beyond that, you've owned a few current sportsbikes, and once the novelty wears off they somehow seem less fun to ride than oldies with wobbly handling and no fairing to hide behind. Beam me back to the 1970s, Scottie! "Beam me back to the 1970s, Scottie"! To return to the question of whether a Jota was worth half as much again as a Z900, judging by its record in production racing, the answer is definitely yes: Laverda triples ridden by PK Davies and Roger Winterburn, amongst others, were consistent winners, whereas standard-trim Kawasaki Z900s were conspicuously absent from the front of the field. Even Triumph Bonnevilles beat them! Although the four-cylinder, dohc engine was renowned for its strength and reliability, Big K still had a lot to learn about frames, brakes and suspension. So, while the Jota became a legend in the second half of the 1970s, Kawasaki's glory faded. The Z1000 introduced in '77 was more torquey and possibly a bit more predictable in corners, but still didn't shout 'Buy Me'. Worse still, Yamaha launched the XS1100, Suzuki the GS1000 and Honda the CBX, all of which did most things better, including going very fast. Of course, Kawasaki attempted to trump the lot with the Z1300 six, but that overweight monster was about as sporty as Luciano Pavarotti. Eventually time caught up with the Jota, too. When the Z13 appeared in 1979 it looked better than ever in its orange and silver paint scheme, but with typical Italian flair Laverda made some major changes to the engine (to reduce mechanical noise), resulting in a spate of breakdowns and expensive warranty claims. Slater Bros, the British importer responsible for the Jota's development from the original 3C, did their best to cope, and a team of engineers came over from Italy specially to rebuild engines. As the Eighties dawned, brute force motorcycling, Laverda-style was looking distinctly old-fashioned. 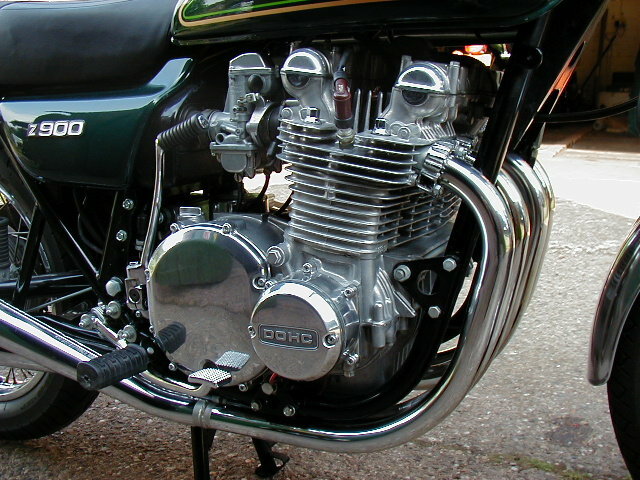 In 1981 the Jota lost its 180 degree crankshaft (one piston down, two up) and was given evenly-spaced firing intervals. At the same time the engine was rubber-mounted, so at a stroke (pun intended) the feature that gave the bike its character, sound and name, was gone. So much for the history. Now let's go for a ride. RWHS specialise in Kawasaki 900s, so blagging one to go for a thrash around the countryside... sorry, I mean, selecting an example for road test evaluation, was no problem. Z1s are usually worth more than Z900s, but as always everything depends on condition and how close it is to standard. A set of four genuine silencers obviously makes a big difference to price, so if originality isn't a concern buy a bike with a four-into-one. The money saved will cover the cost of insurance, petrol and other running costs for years! To me, the Z1A is the best-looking of the lot, but the Z900 has better handling and brakes, thanks to stronger forks and twin discs as standard. On the other hand, despite manufacturer's power figures showing only a slight power loss, Z900s are noticeably slower. They also sound a lot less mean, because anti-noise legislation was beginning to bite by then. Whether any of this makes much difference on real-world roads is doubtful. Even after thirty years, any Kawasaki 900 is still potentially faster than most things on the road in a straight drag. Up to about 100mph a Z1 won't lose out that much to a current sportsbike, because no matter how much horsepower there is on tap, tremendous skill is required to apply it all to tarmac effectively. What you must remember is that this only applies if the road is straight and smooth. As soon as a corner or a bump looms, slow down and let your pal on the Suzondakahsa GSXRRZX Thunderblinja disappear into the distance, if you want to live a bit longer. Fitting a set of modern tyres will improve the handling of any 1970s or 1980s bike, but don't expect miracles. (And don't try to fit wider boots, because the rims aren't suitable and there probably won't be enough clearance, anyway). Health warning over, it's a gross exaggeration to say that Z1s or Z900s are dangerously unstable, as claimed by some people who should know better. Certainly they don't go round sweeping 120mph bends like a Ducati 999, but when ridden with a reasonable amount of thought you'll have absolutely no problems with the handling. It's also worth pointing out that at speeds more typical of everyday use (average speed of London traffic is 8mph), a Z1 or Z900 actually handles better than a modern race replica, thanks to wide handlebars and an upright riding position. You also won't get cricked wrists after ten minutes in town, and being able to see over cars is a safety aid in itself. Brake technology has advanced incredibly since discs first started to appear on bikes, so it's no surprise that the Z1's front stopper is feeble in comparison to what's available today. That said, a properly-fettled 1970's caliper shouldn't be too much of a liability. If the brake feels seriously weak, neglect of the basics (hydraulic hoses should be replaced after a few years, for instance) is often the cause, rather than design deficiencies. To sum up the Z900, the overall impression is of a practical, easy-to-ride bike that's as happy to trundle around town as it is to blast to 100mph in ten seconds. The gears change smoothly, the clutch action is light, and from tickover to 9000rpm the engine delivers the goods with absolutely no signs of artistic temperament. 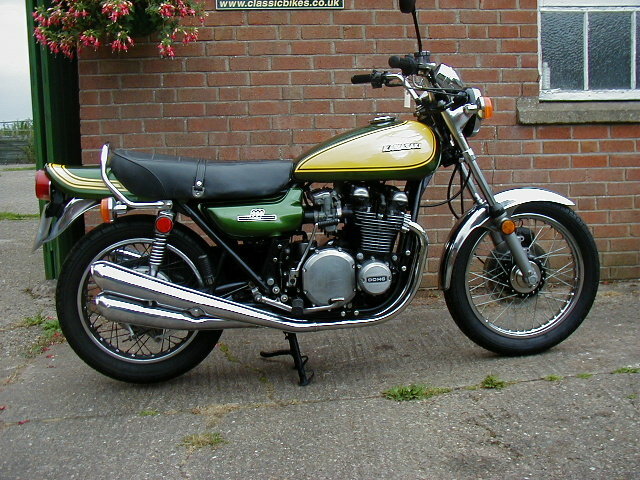 But it's certainly not bland or characterless, which is why Kawasaki's original King is so sought-after. Laverdas have never been accused of lacking character, of that you can be sure! 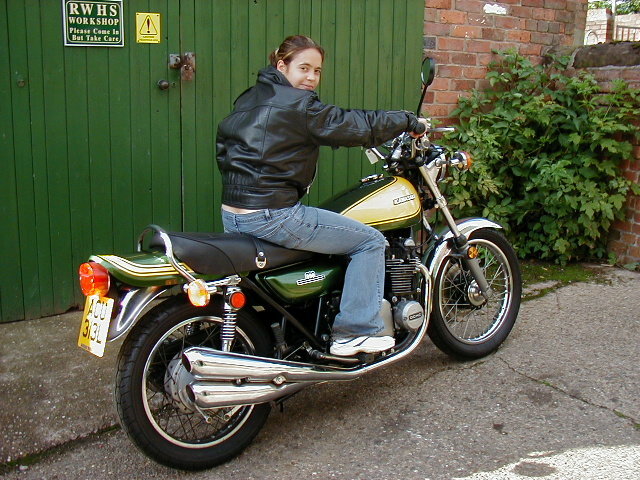 While a Z900 can be treated just as a practical means of transport, every ride on a Jota is a special occasion, requiring far more involvement from the pilot. In fact, Lavs are so big, tall and heavy that just getting one out of the showroom/shed and pointing it in the right direction is a bit of a performance. Although a Kawasaki four weighs about as much, the Jota does feel harder to manhandle, partly because the trademark adjustable handlebars are narrower and offer less leverage. 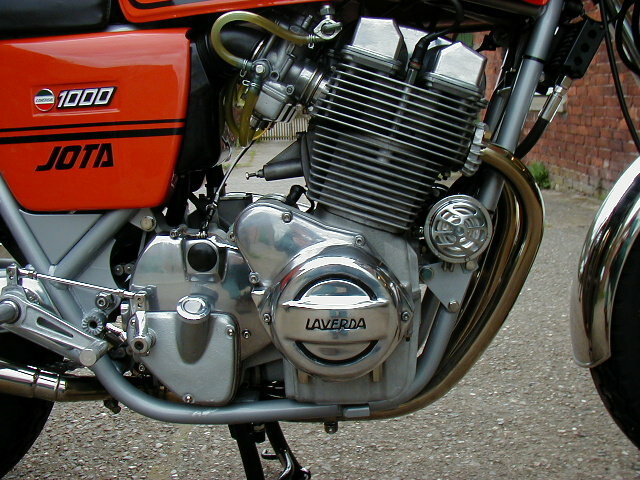 Unlike Z900s, Laverda triples don't have kickstarters, so if the battery hasn't enough life to get those big 10:1 compression pistons moving at a decent speed, you have to push! Compared to most Italian bikes of the era, Laverda electrics were pretty good (as mentioned, much of it is German-made), but early models still only had a 140W alternator, so you might discover that bump starting isn't really much fun. No such athletic feats were necessary in this case, and the engine fired immediately on the button, making a noise that is unmistakeably Jota - the name, dreamed up by the Slater brothers, actually comes from a Spanish dance in triple time. In effect, it sounds like a four with one disconnected cylinder, but at high revs everything blends together into a glorious snarling roar. This bike is LOUD. Start a bog-standard Kawasaki Z900 nearby and you wouldn't even notice it was running. 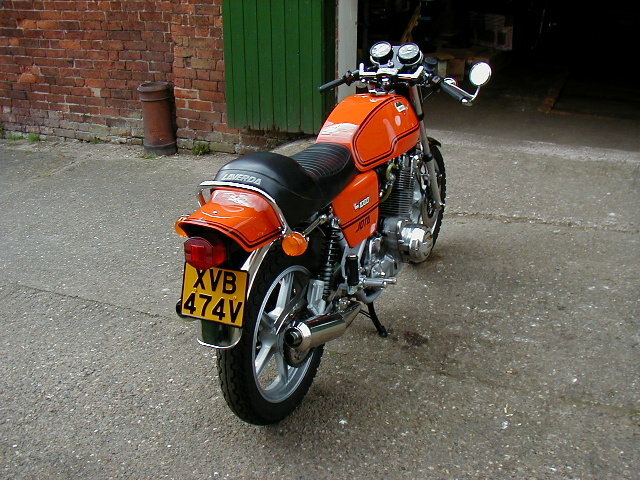 "Jota - a Spanish dance in triple time"
Having rattled the neighbours' windows (whether this is a plus or a minus depends if you like them or not), the Laverda loses more points for ease of use. The heavy clutch, throttle and steering make going slowly something of a trial. Another reason to get out of town as soon as possible is the engine's reluctance to run smoothly until the rev counter is somewhere in the upper half of the dial. In terms of acceleration, Jotas are probably slightly slower off the mark than Z900s, but will start to pull back and take the lead once into their stride. A more aerodynamic riding position ensures that once you get there it's far easier to hold on, too. Jotas will go round most corners faster than Z900s, and they did win all those production races, but personally I've never been convinced that they handle particularly brilliantly. Back in the 1970s, they had better suspension and tyres than Japanese bikes, no argument. And I reckon that just having a more lean-forward riding position than the norm for those days would improve high-speed stability. But Jotas did have very slow handling and they could still wobble spectacularly when really pushed. Ducatis were altogether better - pity they broke down so often that you rarely had a chance to find out! Choosing between the two is as difficult as it was back in 1976. Even the price differential is about the same for bikes in similar condition. About £3000 is entry level for Jotas (make sure it's not a fake), and don't expect to get anything approaching mint condition for under £6k (NB this price guide was of course written in 2003. Now 10 years later in 2013, whilst you can still buy tatty Laverdas and Kawasakis for under £3000, the very top condition and genuine examples are often now more than twice the £6K quoted here). What has changed now these machines are firmly in classic territory is the way they're used. So the fact that the Kawasaki is far more practical for regular use is less important than it was back in the days of flared trousers and kipper ties. Yet, as relatively cheap insurance is available for both, and depreciation will be minimal, or negative, it would actually make quite a lot of sense to use one of these as everyday transport. The decision is yours! By Rod Ker, February 2007.